Bineta Diop, Femmes Africa Solidarité; Mary Robinson and Hibiba Mejri Cheikh, Director, Information & Communication, AUC. On 23 January, Mary Robinson attended the Gender is My Agenda (GIMAC) 21st Pre-Summit Meeting on Gender Mainstreaming in the African union (AU) in Addis Ababa, Ethiopia. 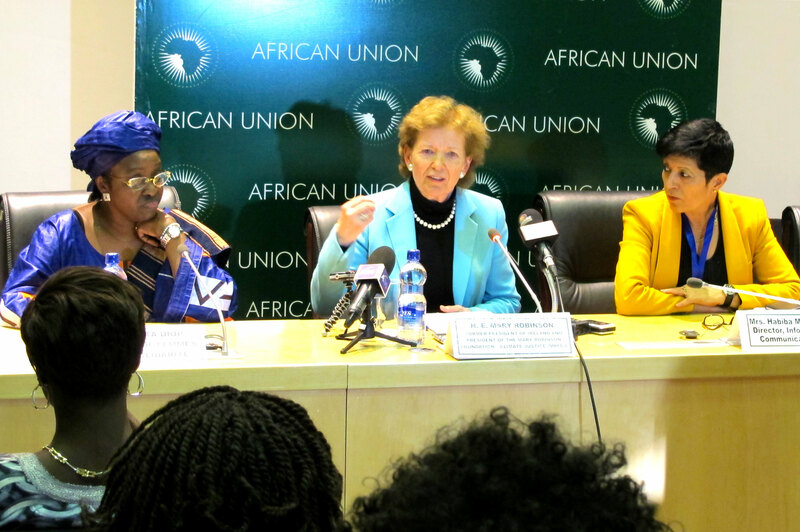 On 23 January 2013, Mary Robinson attended the Gender is My Agenda (GIMAC) 21st Pre-Summit Meeting on Gender Mainstreaming in the African union (AU) in Addis Ababa, Ethiopia. The GIMAC meeting is held twice a year on the margins of the African Union Summit. The overall objective of the meeting is to link the gender mainstreaming strategies on the African continent with the on-going struggles on the social, economic and political front, and also examine their impact on the efforts to promote intra African trade, and make recommendations to the AU Heads of State Summit. Participants include representatives from the 55 civil society organisations that form the GIMAC network. Speaking at the press conference following the meeting, Ms. Robinson highlighted the injustice of climate change and how it is undermining the livelihoods of some of the most vulnerable, particularly in developing countries. She also noted the impacts of climate change on food and nutrition security and how they are exacerbating existing inequalities in access to resources, especially for women who are primarily responsible for food production and for feeding their families. Enact and implement legislation for women to access land and actively involve women farmers in the design of adaptation strategies to address the impact of climate change on agriculture. Ensure women’s equal participation in all spheres of decision–‐making, and the equitable distribution of resources in the post-2015 development framework.